Why don't you : try some pink pants! 1. Don't have your own DSLR, don't worry, great pictures are just one iPhone click away. 2. Have you checked out the fabulousness that is J.Crew Factory lately? Jill really hit all the high notes here. 4. I am still feeling good after my big purge, & think maybe I should follow these tips to pinpoint my closet craziness for February. 6. You ladies have the BEST advice, thank you for your tips about keeping my red hair red, this red-head beauty has some tips to share too - great to check out if you are looking to up keep your expensive salon dye job. Don't forget to enter the MsDressy.com giveaway for a $80 gift card here. What you you looking forward to most during the Super Bowl? commercials? you team's big win? I'm super pumped for Beyoncé's half time show! Yay time for pink jeans although I am tired of coloured jeans but I can give up for pink. I've started using MAC Red by, you guessed it, MAC! It's a true red with blue undertones and it's perfect. It apparently works with the most skin tones. I have some pink pants like the ones in the first picture (a bit more cropped from Ann Taylor) and they go with so much actually! Love the pink pants pics! And Jill picked all of my favorites from the new Factory items! oooh love your pink pants! and those iphone tips were helpful since i don't have a dslr camera yet! I just turned 25 last week, think I may steal your 30 before 30 post! 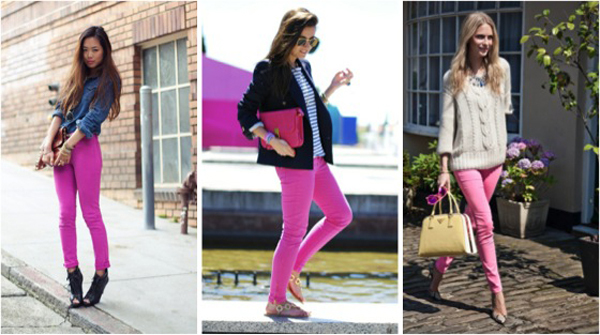 Loving all the looks with pink pants! They're such a great way to add a pop of color to a look! And I know what you mean about the iphone pictures! I saw a friend's vacation photos and I couldn't believe that they were simply taken with an iphone! I can't wait to get some of these ! Join my galaxy leggings giveaway! 2 DAYS LEFT! Thanks for including me! It's about time I did another big closet clean out myself! Loving those pink pants, so fun especially for spring!